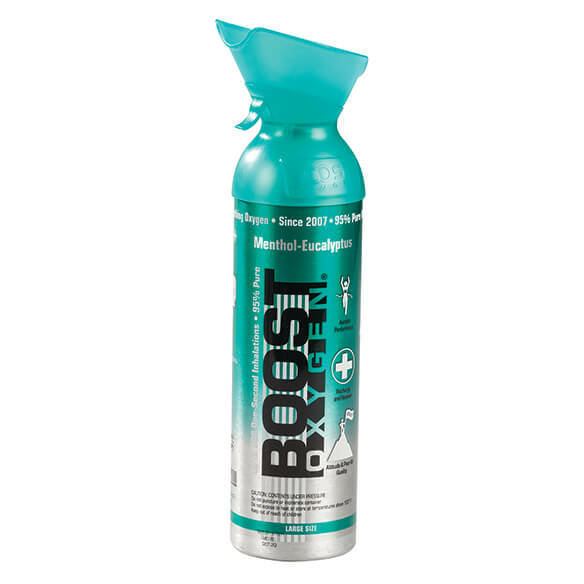 Refresh and rejuvenate with Boost Oxygen® Menthol Eucalyptus. Helps you breathe easy at home or on the go. Mask helps ensure maximum flow of fresh, clean air. Simply place mask over mouth, pull lever and breathe in through your mouth. Safe and effective. Perfect for seniors, active people and high-altitude visitors. Oxygen canister contains more than 200 one-second inhalations. 100% natural, water-based essence of Menthol-Eucalyptus Aviator’s Breathing Oxygen. 10 Liter Canister. 1. Place mask under nose and over mouth. 2. Press trigger down to activate flow. 3. Breathe in through the mouth.